We have all heard his music. Ludwig van Beethoven, famous for his nine symphonies along with his ubiquitous piano compositions and other chamber works, is more than just the sum of his music. 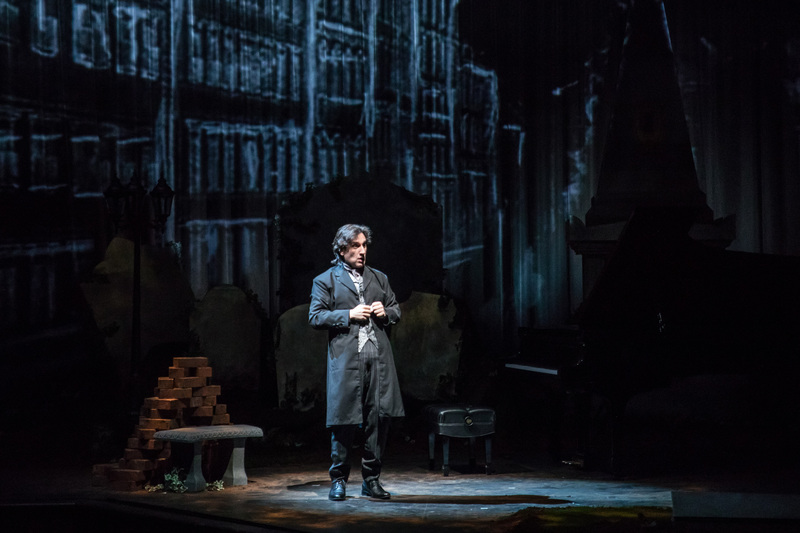 Hershey Felder is back on the TheatreWorks stage telling the fascinating story of Beethoven’s life from the perspectives of both Gerhard von Breuning and the maestro himself. 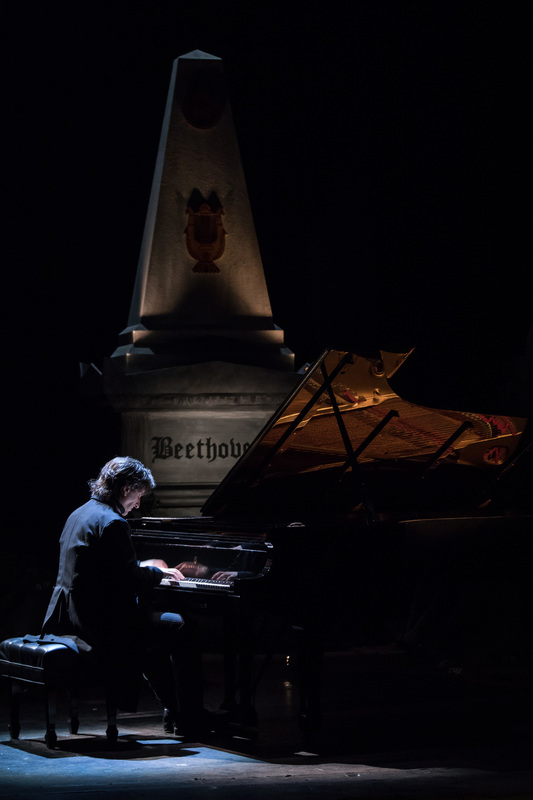 Hershey Felder, Beethoven, with text by Hershey Felder, is based on Dr. Gerhard von Breuning’s personal recollections published in 1874 in “Aus dem Schwarzspanierhaus.” Felder’s presentation, punctuated by his piano virtuosity, is absolutely stunning. The action takes place in October 1863 Vienna. 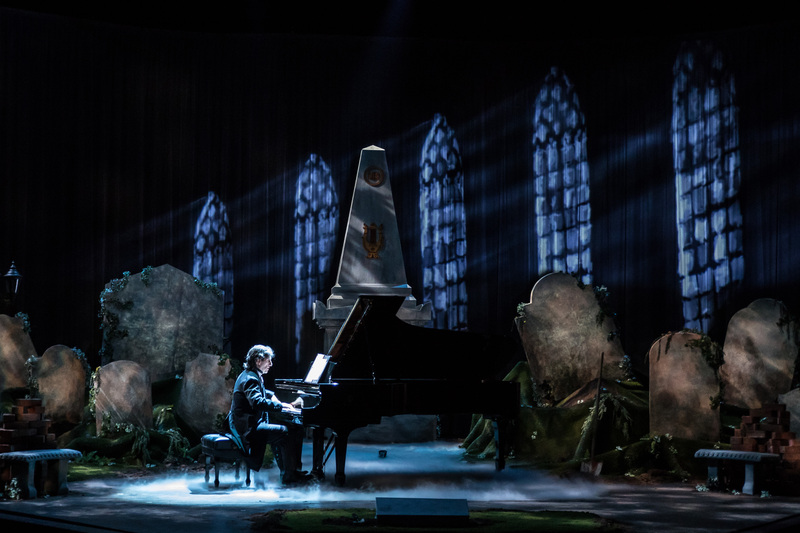 It is set in a graveyard surrounded by artfully placed tombstones, a shovel, some dirt, bricks that had previously covered a metal box, and a Steinway grand piano center stage. Felder’s set is gorgeous, and Christopher Ash’s lighting and projection design add greatly to its effect, both in the graveyard itself with a very realistic background, and in flashback sequences taking the audience into the city or inside various structures with all the accoutrements. Some abstract projections also come into play, enhancing the tone of a given scene. The lighting and upstage sections of the set give the production a subtle, and slightly spooky, antique feel in various shades of gray. At the top of the show, Felder, as Breuning, stands alone as he tells his boyhood tale of his friendship and admiration for the great Ludwig van Beethoven, in hopes of swaying the committee (presumably the audience) to not again bury Beethoven’s remains in this graveyard. Instead, he wants to keep them above ground to ensure Beethoven is never forgotten, but also to determine why he was afflicted as he was in life. Breuning starts by describing a chance encounter he had while walking with his father when he was but twelve years of age. They came upon a filthy and seemingly crazed vagrant who approached them, talking to the air. This stranger then addressed Breuning’s father as though he knew him, and worse, called young Gerhard by name. Breuning, recounts the subsequent discussion he had with his father after the encounter, whereby he learns of his father’s childhood friend, “the little Beethoven.” He learns that Beethoven’s father was a brutal man who would wake the little Beethoven up in the middle of the night to practice. If he didn’t perform well enough, his father would bring him to the cellar and beat him about the head, leaving him there until his meek mother found him the next day. As an aside, although not in the historical record, one might wonder if Beethoven’s father directly caused his later disability. Breuning relates how his own father, Stephan von Breuning, became acquainted with the little Beethoven, and how they studied music together as boys. The lifelong friendship that ensued had its challenges over the years, but after Gerhard’s fateful encounter, he describes his own friendship with Beethoven, seeded by his father, as precious and life changing. It becomes clear from Breuning’s tale that Beethoven was a gifted and caring man, yet he also possessed a mercurial temperament which made for some significant challenges in his personal life. Felder’s performance is riveting as he first embodies Breuning, then Beethoven himself, often in conversation between the two, and the musical magic is never far away. Music punctuates the performance in many ways. First Breuning, plays with a C minor chord, telling the “committee” of Beethoven’s fascination with it. He describes in detail how the C minor chord is dark; whereas, the C major chord is light. He then suggests that Beethoven’s lifelong battle between the dark and the light, reflected both in his music and in his personal life, mirrors this musical relationship. Over time, Felder lapses into several Beethoven classics including portions of Symphony #3, Symphony #5, Op.27 Piano Sonata No. 2 in C# Minor (better known as the “Moonlight” Sonata, though the story makes clear Beethoven never named it that), Op.13 Piano Sonata No. 8 (“Pathétique”), and others. At one point, when talking about a particularly difficult time in Beethoven’s life after Mozart’s death, Felder plays and sings a portion of Mozart’s Requiem as he describes Beethoven’s grieving period. Several times during the performance, Felder begins playing piano alone, and somewhere along the way, his playing is combined with a symphonic recording, particularly during some of the Beethoven Symphony segments. This also happens during Mozart’s Requiem. It’s not done obtrusively, and the recording is balanced under Felder’s piano lead adding emphasis and texture. Felder concludes the production with one Beethoven classic in its entirety that most any piano student would attempt at some point. It’s safe to say that most students would never approach the level of virtuosity and emotion that Felder captures in this breathtaking finale. Beyond the real Breuning’s recollections from “Aus dem Schwarzspanierhaus,” another major influence creating Felder’s keen interest in Beethoven was the “Heiligenstadt Testament.” This document was a letter in Beethoven’s own handwriting to his younger brothers Karl and Johann (both mentioned in the production as having a profound effect on the maestro). It was written when Beethoven was 31, but it documents first-hand the difficulties he experienced because of his increasing hearing loss which started in his mid-twenties. Although we now know he continued his composition work throughout his life, his hearing loss posed a significant challenge both professionally and socially, and Felder’s storytelling brings that to life very dramatically. Following the bows, a recording of the final movement from Beethoven’s Symphony No. 9 accompanies the audience exit, ensuring that their immersion into the life and music of Beethoven is complete. One cannot leave the theater without being in awe of the music and the man. Beyond Beethoven, one will also come away from this production with a great appreciation of Hershey Felder. He’s a performer unlike any other, and one cannot see this production and not be in awe of his talents as an actor, as a musician, and knowing that he wrote the script, as a writer. His understanding of the lives of the various composers he studies is impressive, and his characterizations make them all the more accessible and vibrant to us all. Do not miss this extraordinary production. See http://www.theatreworks.org/shows/2016-2017-season/beethoven, email boxoffice@theatreworks.org, or call (650)463-1960 for more information or to order tickets.